Avenue of palms, Botanical Gardens, Calcutta. 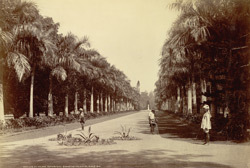 bl.uk > Online Gallery Home	> Online exhibitions	> Asia, Pacific and Africa Collections	> Avenue of palms, Botanical Gardens, Calcutta. Photograph of the Botanical gardens, Calcutta, from the Elgin Collection: 'Spring Tours 1894-98', taken by Bourne and Shepherd in the 1890s. Situated on the west bank of the Hooglhy River, Calcutta the Royal Botanical Gardens were founded in 1786 by Colonel Robert Kyd. The objective was to collect plants indigenous to the country and for introduction and acclimatisation of plants from foreign parts. The gardens were the leading centre for botanical investigation and it was here the varieties of Assam and Darjeeling tea were developed. The gardens were also an important source for the cultivation of orchids, bamboos and palms, supplying plants to Kew and other European gardens.